Р. 74-81, Bibliography 24, Ukrainian. The cultivation conditions of Bacillus thuringiensis ІМV В-7324 with fibrinolytic activity was studied. It was found that maximal synthesis of enzyme (4,17 U/mg of the protein) occured at the stationary phase of the strain by submerged cultivation. It was shown that all the components of the basic medium without gelatin were significant for biosynthesis of peptidase. Elimination of gelatin resulted in increasing of the activity in 4 times (21 U/mg of protein). Influence of nitrogen and carbon sources on enzymatic synthesis was studied. It was found that the optimal synthesis sources were ammonium sulfate and maltose. Their application enabled to increase the initial activity in 12 times (50 U/mg of protein). The optimal concentrations of ammonium sulfate and maltose in the medium which allowed increasing the fibrinolytic activity in 25 times (105 U/mg of protein) was determined by bifactorial experiment on four levels. The optimized nutritious medium contained (g/l): maltose — 19,0, (NH4)2SO4 — 12,0, КН2РО4 — 1,6, ZnSO4•7H2O — 0,25, MgSO4•7H2O — 0,75. Key words: fibrinolytic peptidase, Bacillus thuringiensis, carbon and nitrogen sources, bifactorial experiment. 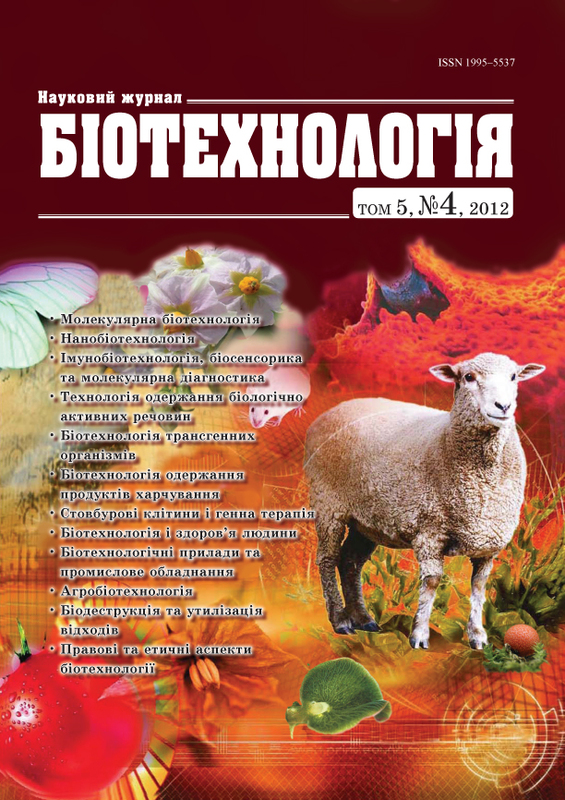 2014-11-24 - OPTIMIZATION OF ELASTOLYTIC PEPTIDASE BIOSYNTHESIS BY Bacillus thuringiensis ІМV В-7324 Nidialkova N. А., Matseliukh О. V., Varbanets L. D.
OPTIMIZATION OF ELASTOLYTIC PEPTIDASE BIOSYNTHESIS BY Bacillus thuringiensis ІМV В-7324 Nidialkova N. А., Matseliukh О. V., Varbanets L. D.